1. Renewable energy technology is economically unsustainable because it is largely dependent on government subsidies. While renewable energy technologies are aided by federal economic incentives such as tax credits and rebates, they help spur economic growth through increased demand in renewable energy, which translates into greater growth and job creation. The more accurate way to assess the economic feasibility of different types of energy is to compare their levelized cost without subsidies. Levelized energy cost is the universal per unit cost of electricity calculated by dividing the total production and operation costs of a power plant by the quantity of electricity produced over its lifetime. Two credible sources of research on energy economics are the Energy Information Administration and Lazard Financial Analysts. 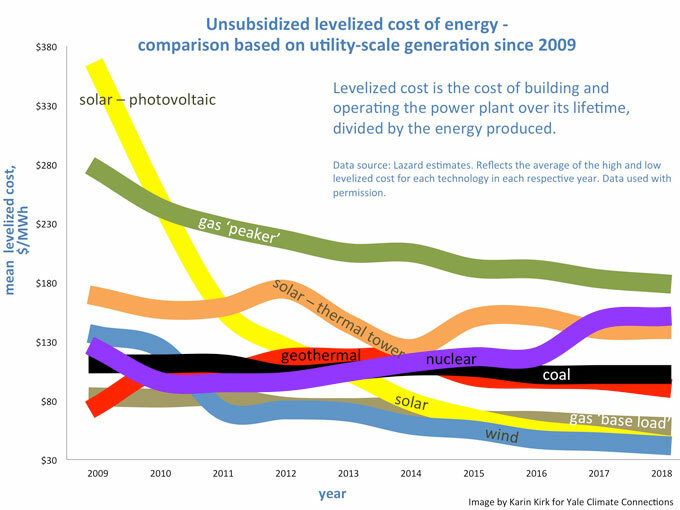 Both of these organizations conducted detailed and comprehensive studies on the levelized cost of electricity and came to the same conclusions—that solar and wind energy are less expensive than any of the fossil fuels (coal, propane, and natural gas) based on a per unit cost-production analysis. 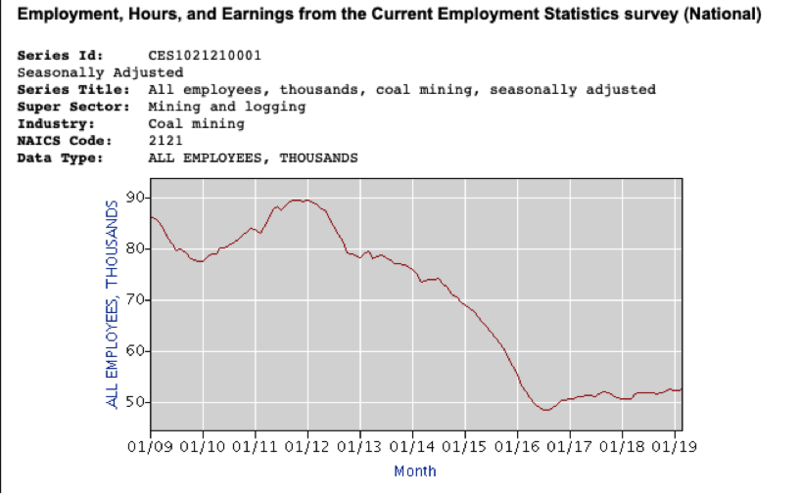 According to the U.S. Board of Labor and Statistics, the rate of growth of employment in coal mining has precipitously declined over the last decade. On the other hand, the top two fastest growing jobs in the U.S. economy in 2016 were solar installers and wind turbine technicians, respectively. According to the U.S. Bureau of Labor Statistics, employment of solar installers is expected to grow by 96% between 2016 and 2026, and for wind turbine technicians, the growth will be 105%. Now how’s that for economic prosperity and job security? It is true that solar panels contain a small amount of heavy metals and toxins. But these metals are found in a wide range of ubiquitous electronic devices, such as computers and cell phones. However, unlike these technological gadgets, which are designed to be replaced every few years, solar modules are usually warrantied for 25 years. In terms of the manufacturing, “Solar panels are mostly made of glass, which is easily recycled. The remaining major components are plastic, aluminum, silicone, and metals, each with its own pathway for recycling and disposal. The recycling efforts of solar panel manufacturers can be compared using the Solar Scorecard.”  In terms of the ability to recycle existing solar panels that are broken or being replaced, there are currently companies that provide recycling services and the list is growing. While it’s true that wind turbines are a source of bird fatalities, those numbers should be put in perspective with other causes of bird deaths. According to the U.S. Fish and Wildlife Service, the estimated number of birds that die each year due to oil pits (750,000) is nearly twice that of the birds that die due to wind turbines (328,000). Moreover, when compared with other types of energy, wind turbines actually rank the lowest with regard to bird mortality. According to a wildlife study published in the Journal of Integrative Sciences “fossil fuels cause approximately 35 times more bird deaths per unit of energy generated” than that of wind energy.